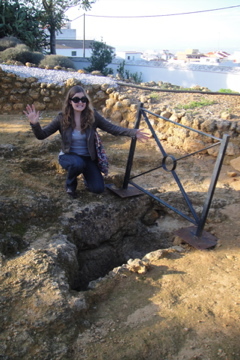 The ruins included several tombs, as well as an amphitheater where archeologists guess gladiator fights took place! 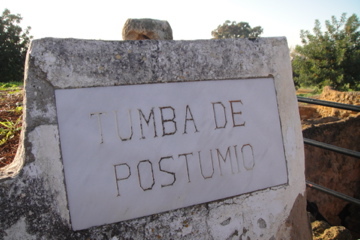 Any statue or pottery remains were inside the little museum on-sight, so the tombs were basically empty pits. 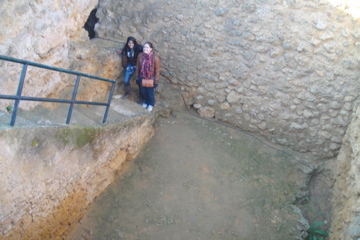 Still, it was very interesting to see what’s left and imagine people in that spot over 2000 years ago! 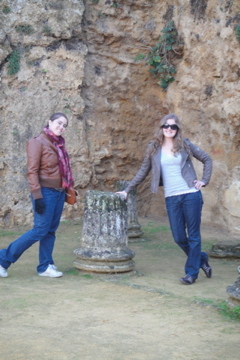 Our tapas trail began when 2 girls from the group were brave enough to approach a gang of older men, tricked out with newsboy caps, tweed and Ray-Ban sunglasses (the elderly man uniform of Spain), to ask for a recommendation. They pointed us to a place near-by. Another older man greeted us at the restaurant, and helped us arrange tables for our larger group. Then, he proceeded to go inside, return with a glass of red wine, and plant himself in a chair in the sun facing the plaza, letting a younger man working there take care of our table. What a work day! We had a tapas sampler that was beautifully presented and had some stand-out dishes- the calamari and the Russian salad (cold potato salad) were very good. 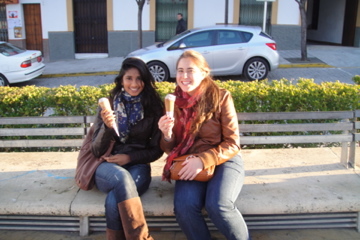 After basking in the sun a bit, we moved on to Round 2 of our Tapas Trail experience. 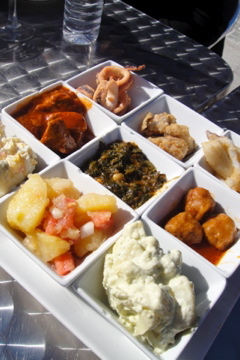 The second place was closer to a typical tapas experience- no fancy presentations, just simple platters of food. Their croquetas*, fried potatoes and bread were all amazing. Plus, the tables of the cafe sit in the shade of a part of the ancient city wall! 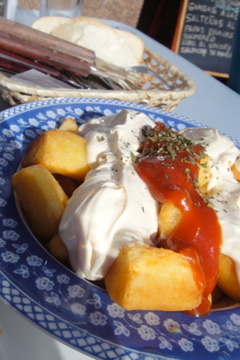 Papas bravas= fried potatoes with a “spicy” sauce (in Spain, their heat tolerance is generally very low, so when you see “spicy” on the menu, you should translate that as mild to perhaps not spicy at all), and a generous amount of mayonnaise (also a note on Spanish mayo- the quality of Spanish mayo is much better than the US. Many people grew up here with their mom’s homemade mayo, and so they don’t accept gloppy stuff that tastes like Best Foods)! 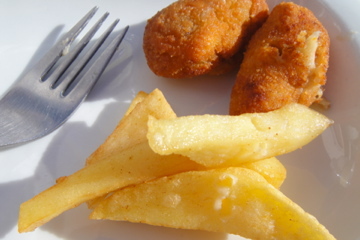 A close-up of some croquetas and fries. *Croquetas= a cooked filling (like ham, cheese, spinach, etc.) mixed with bechamel (a French white sauce), coated with breadcrumbs and fried. There are many variations on croquetas in Spain, and a lot of them are delicious! Also, their fries are no McDonalds fare- they’re often fried in olive oil, which I think gives them a less greasy and crunchier exterior. Since they’re freshly made, they also taste more like an actual potato. SEE YOU IN ABOUT A MONTH !!! aww! what a cool city!! historical remains are always so neat-o! hahah 🙂 and i love that picture of julia and a friend with the ice cream cones! how fun!